No shuttle-chasing or remote parking lots - it's all right there. Add your signature chocolate chip smiley face to the ones for the kids. Once you've adjusted to the altitude and seem to be breathing normally again, hit it like the cardio champ you are. Somehow, even after a day on the slopes, they're still going strong. Round up as many people as you can fit around the coffee table and make a serious dent in that puzzle you brought. It's like having a second (bigger, and even livelier) living room. 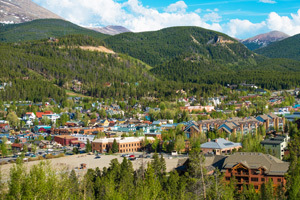 You're steps from Breckenridge Ski Resort (great news for anyone in ski boots). Slopeside location offers ski-in/ski-out access at the base of Peak 8. Visit the Rejuvenation Mini-Spa for a facial, massage or a body wrap. Recover from your day on the mountain with a soak in the outdoor hot tub. Gather your crew and go hike Spruce Creek Trail – it's a quick 15-minute drive. Brush up on your short game at nearby Breckenridge Golf Club (a 12-minute drive). If ski-valet and spa are just your style, consider One Ski Hill Place a done deal. It’s a picturesque slopeside luxury escape at the base of Peak 8, nestled in the heart of the action with four chair lifts and a heated deck and fire pit right outside. Inside, the three-sided lobby fireplace invites you to sit, drinks in hand, for a heated family debate over whose wipeout wins Most Epic. When you’re ready to go from about six outer layers down to just a swimsuit/towel combo, head for the indoor pools, steam room and sauna, or the outdoor hot tub and fire pit. Duck out of skiing at least one afternoon for massage treatments, aromatherapy and the signature Alive & Ageless facial at the private Rejuvenation Center. Later, hit the game room, or team up and show off your knack for hitting spares at the private Mine Shaft two-lane bowling alley – shoes and balls are on the house. And there’s no need to venture off in search of the happy hour scene. You’ll find T-bar, the #1 bar in Breck, and one of the best après ski bars in the country, right the first floor. Tastefully appointed residences treat you to stunning mountain views, and a private patio or balcony beckons when the weather warms up just enough. Condos range from studios to four-bedroom layouts, comfortably sleeping four to ten exhausted mountain adventurers. Fully equipped kitchens are well appointed with granite countertops and stainless steel Bosch appliances, ready for some serious top-your-own taco night action. Plan on gathering your crew for movie night, either in the family-friendly movie lounges, or right in your living space, with the moss rock fireplace aglow. It likely won’t be a late one. Expect semi-early bedtimes for your wiped-out crew (who will no doubt be dressed and ready, standing by the door hours before the first chair the next morning). Historic downtown Breckenridge is a must, and the seasonal BreckConnect Gondola whisks you there in minutes (curbside shuttle service, also an option). Explore the town’s mining base camp roots, with its 250-building historic district and about as many newly-built shops and restaurants. If you’re here in the summer, the nearby Breck Summer Fun Park is a can’t-miss, starring the Gold Runner Coaster, Alpine SuperSlide, TenMile Flyer Zipline, Bungee Trampoline and more. Or if golf’s more your speed, hit the 27-hole Breckenridge Golf Club, the world’s only Jack Nicklaus-designed municipal course.